RECONSTRUCTION SURGERY COULD BE REQUIRED AFTER AN INJURY TO THE ANTERIOR CRUCIATE LIGAMENT. The anterior cruciate ligament (ACL) is one of four main ligaments of the knee. 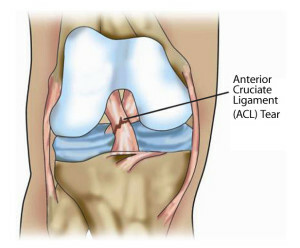 A rupture or tear to the ACL is a common injury suffered by active persons. Surgical reconstruction is often required to regain full knee function and stability. 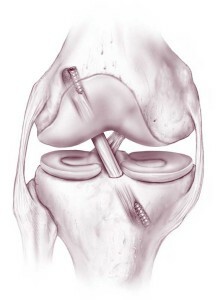 ACL reconstruction surgery should always be done by highly-trained orthopedic surgeons, also known as orthopedists. How does this injury usually occur? Most ACL injuries happen during sports and athletic events which are non-contact, and therefore have no external contact with the knee joint. This suggests that the injuries are as a result of abnormal movements such as pivoting, sudden changes of direction and bursts of speed. Soccer, basketball and volleyball are some of the sporting activities which have the highest risks and incidences of anterior cruciate ligament injury. Do all ACL tears or ruptures require surgery? Your orthopedist will, after a comprehensive examination, present you with the results that will help you to decide whether or not to opt for surgery. Bear in mind that the goal of surgery is to restore as close as possible the level of stability and function to the knee which you had before you had the injury. 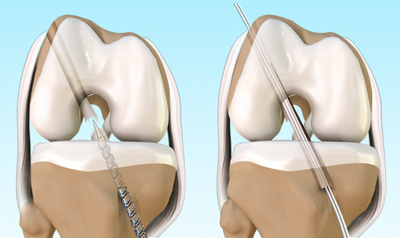 You may opt for surgery if : Your knee is very unstable due a completely torn, or a severely partial tear of the ACL. After undergoing a rehab program your knee is still unstable. You are very active in sports or have a job where full knee strength and stability is needed. You have a chronically unstable knee which is affecting your quality of life. You have injuries to other parts of the knee such as the cartilage or meniscus. You may choose not to have surgery if: You have an ACL tear that may respond to rest and rehabilitation. Neither sporting activities nor your job require a perfectly stable knee. You feel able to complete a rehab program to stabilize your knee and strengthen your leg muscles to reduce chances of another knee injury. Does ACL reconstruction surgery work well? ACL surgery, when performed by a competent orthopedic surgeon, has a high success rate with very few problems relating to the surgery itself. Many surgeons use arthroscopic surgery in preference to open surgery. Arthroscopy makes it easier for the surgeon to see and work on knee structures. Arthroscopy also uses smaller incisions than those required in open surgery, and the operation can be simultaneously done when identification of any other knee damage or injuries. Is needed. Arthroscopic surgery can be performed under spinal or general anesthesia, depending on the choice of the patient. Post operative care and physical rehabilitation is a most important part which contributes to the success of the procedure. For satisfying results, religiously follow the instructions of your doctor to re-establish a fully functional, stable knee. If you have been told you sustained an ACL tear or wish to obtain a second opinion, contact our sports medicine specialists to provide you options that best suite your needs.